a cube with slightly skewed angles. All the tesseract's names and shapes are attempts to visualize what we can never understand. What does the fourth dimension look like? Most people's first encounter with the word 'tesseract' was in the dimension-hopping parts of A Wrinkle in Time. Madeleine L'Engle's characters hopped through vast reaches of space by 'folding' space into higher dimensions, bringing the edges of the three dimensional universe together the way someone might fold the edges of a towel together. This practice was called 'tesseracting,' and it worked very well, until the characters were nearly killed by accidently getting into a two-dimensional universe. L'Engle wasn't making the term up. She used a term coined by mathematician Charles Howard Hinton in the late 1800s. It refers to a cube, or what a four-dimensional being playing with four dimensional objects would consider a cube. Just as the surface of a cube consists of 6 square faces, the hypersurface of the tesseract consists of 8 cubical cells. 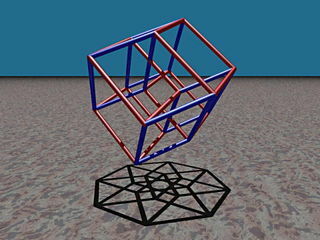 A tesseract is bounded by eight hyperplanes which intersect to form 24 square faces in a tesseract. Three cubes and three squares intersect at each edge. There are four cubes, six squares, and four edges meeting at every vertex. All in all, it consists of 8 cubes, 24 squares, 32 edges, and 16 vertices. 1-dimensional: Two points A and B can be connected to a line, giving a new line segment AB. 2-dimensional: Two parallel line segments AB and CD can be connected to become a square, with the corners marked as ABCD. 3-dimensional: Two parallel squares ABCD and EFGH can be connected to become a cube, with the corners marked as ABCDEFGH. 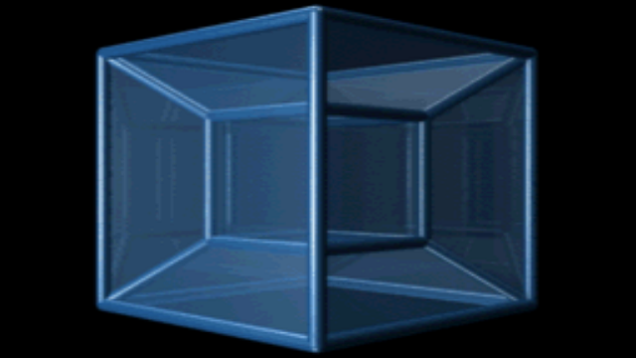 The tesseract can be unfolded into eight cubes into 3D space, just as the cube can be unfolded into six squares into 2D space. Understanding the concept of 4 dimensional objects and tesseracts in particular is pretty tough stuff. This cafe station was meant for you to become aware of what 4th dimensional space was, what a tesseract was and also how this concept was used in the novel A Wrinkle in Time. In the story, Madeleine L'Engle calls it the 5th dimension, but in reality a tesseract is part of the 4th dimension. Also, we do not know if tesseracts (and 4th dimension) support the idea of time and space travel. That is a scientific prediction made by L'Engle in her book based on the study of quantum physics at the time. Maybe it is true - you may live to find out! Madeleine L'Engle is the author of many science fiction/fantasy novels. In A Wrinkle in Time, L'Engle's characters travel through space and time by way of a tesseract that she calls "tesseracting." At this café station you will learn about the mathematics of a tesseract. Work in pairs and follow these directions to learn what a tesseract is and what 4th (or even 5th) dimensional space is all about. Then follow the activity directions below to build your own tesseract, or hypercube. 2. Click the Bookmark labeled Tesseracts. 3. View the short video clip from The Avengers movie which refers to a tesseract that allows time/space travel. 4. Read the Definition of a Tesseract box and Tesseracts are Tough Stuff box. 6. ACTIVITY: (WIth your partner) Take an activity bag containing cut sticks and fun tack. Follow the directions on the sheet at this station. First build a 3D cube. Then take the pre-built mini cube and attach it inside your 3D cube to create a hypercube or tesseract just as shown in the pictures and videos. Move it around in the air and notice the different ways it looks depending on the angle. In The Avengers movie, the tesseract is an energy source that provides a "door" into the "other end of space and time." A real tesseract is a 4 dimensional space, not an energy source, but it makes for a fun movie! 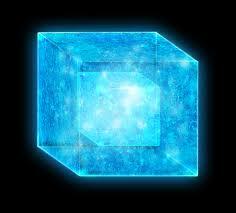 The tesseract is a four dimensional cube.The tesseract is to the cube as the cube is to the square. The tesseract consists of eight cubical cells. Unwrapping a Tesseract (4D Cube) in 3D Space! Watch this video that shows how an unwrapped tesseract might look in our 3D space - mind blown! If you are REALLY into learning about the 4th Dimension, watch this video in which a high-schooler explains the understanding of expert physicists on dimensions, and in particular, the 4th dimension and tesseracts. He's amazingly good at explaining this complicated topic.